Arrange an appointment or get more information today! Request an appointment with our optometrist Mr Alex Petty (no referral is required). Alternatively you can book an appointment yourself online here. If you need to reorder contact lenses or solutions/eye-drops (these can be couriered to you for convenience). Please indicate what you would like Bay Eye Care to contact you about. Thank you for contacting Bay Eye Care! We will be in touch as soon as we can. Bay Eye Care is located in the medical suites of health care hub Promed House, centrally located just south of Tauranga CBD. 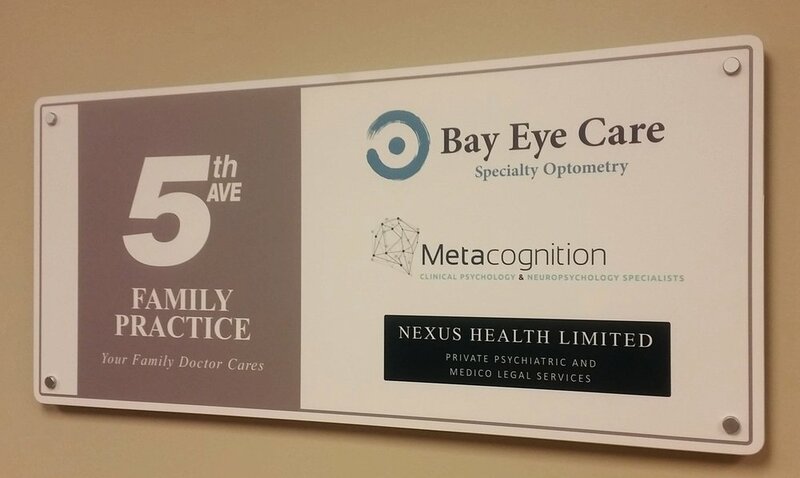 We occupy rooms in the ground floor Suite 2, within the family GP practice Fifth Ave on Tenth. There is ample parking within the complex and on adjacent streets. The sign greeting you above reception at Promed House. Hours: Our reception is open 8am - 5pm, Mon - Fri. Consulting times vary throughout the week.